Adjustable height frame is 61” wide (load side) x 59” deep x 118” tall (±13”) to accommodate for multiple bag sizes. Steel frame constructed of square structural tubing with capped ends, all continuous welds. 316 stainless steel bag filler inlet tube with outer dust control sleeve and a 3” diameter dust take-off with actuated butterfly valve. Filler tube inlet includes an 11″ square, air actuated roller gate valve with 316 product contact surfaces and position switches (Not shown). Fill head features a stainless steel bag inflation system with air amplifier and 4” butterfly valve. Inflatable USDA/FDA approved spout seal creates a dust-tight connection to the bag fill spout, with manual inflation control mounted on the frame. 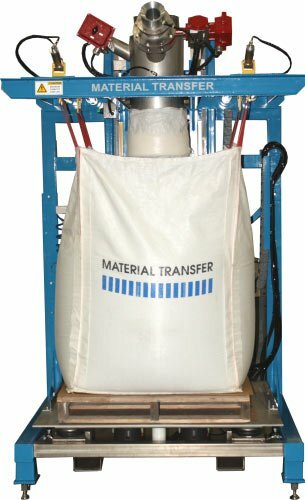 Unit features a custom bag support frame with 12” pneumatically activated lift for ergonomic bag connection and automated disconnection. Pneumatically actuated bag strap release system. Wash-down heavy-duty 316 stainless steel flat top densification system with twin linear non-impacting pneumatic vibrators and pallet retaining angles. Gain-in-weight scale system with NTEP approved load cells and digital weight indicator. System is designed for Class 1, Division 2, Group D and Class 2, Division 2, Group G service locations.